What do you see in this picture? Sharper than most WW II images, this one is of a fairly tranquil scene on the deck of CV-6, USS Enterprise. The shot was taken on May 15, 1942, and the red circles in their insignias had been painted over. That’s barely five months after Pearl Harbor and about three weeks before the crew seen here going about their jobs would be fighting for their lives in the Battle of Midway. Hence, the tranquility—they don’t yet know what is headed their way. But they have an inkling. The war was only six weeks old when the Big E paired with USS Yorktown to raid Japanese bases in the Gilbert and Marshall Islands. And they tasted action when they launched a futile attack against the Japanese on Wake Island. Their combat exper­ience changed their view of themselves: They knew they might be big, but they weren’t invincible. Then, three weeks before this photo was taken, Enterprise had escorted her sister Hornet with 16 B-25s to bomb Tokyo, and they cheered at their success. They had proved that the Japanese weren’t invincible either! If you look at the photo and count, you can also see eight Grumman F4F Wildcats (not GM/Eastern FM-2s) and seven Douglas SBD Dauntlesses. It doesn’t take much research to reveal that this photo contains as many as four times the Grumman-built Wildcats as there are now flying; only two are still in the air. A dozen or so GM FM-2 Wildcats are still flying but a much smaller number of actual Grummans. A dozen or so sit lifeless in museums. Roughly 1,900 Grummans were built, so that’s a survival rate of 1 out of 160. Eastern built 4,000 FM-2 versions (plus 1,200 FM-1s), but only about 25 still exist, which is also 1 out of 160. 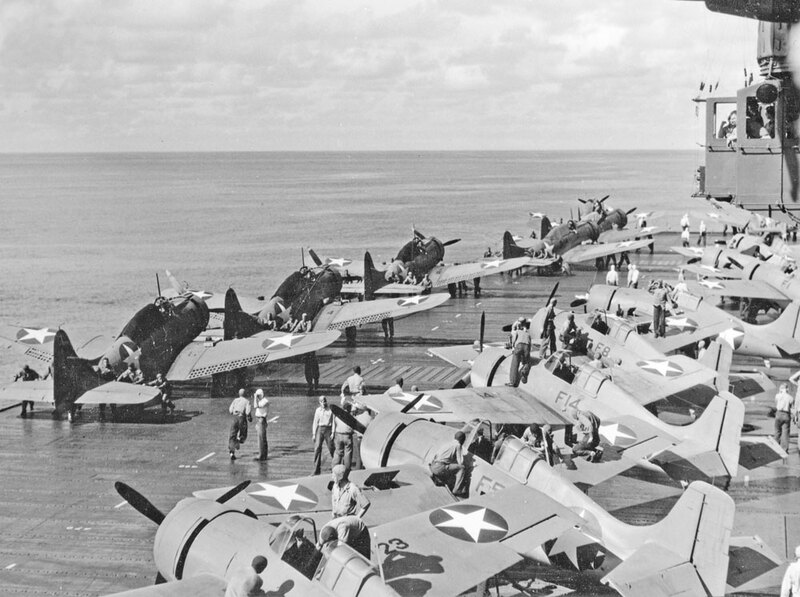 The line of SBDs (with the one hiding behind the carrier’s island) includes almost twice as many as the four now thought to be flying. There are roughly 15 in museums. That’s a survival rate of approximately 1 in 300. There are more than 40 young souls seen working on the Wildcats or repositioning the Dauntlesses. How many of those have survived to today is anyone’s guess, but age alone would dictate the survival rate. Combat would further whittle down the numbers. The youngest would be 91 years old today. Soon, we will have lost them all, while a few of the aircraft will still be with us. Whether they will be in the air or displayed as stuffed dinosaurs in museums, remains to be seen. Seldom have WW II photos survived that are as crisp and reveal as much as this one does. Every time we lay eyes upon any image of this period of history, however, we should remember that we are now standing with one foot in the past, the other in the future. We are even now stepping through a doorway, and on the other side, all we will have of our past will be photos and the memories they engender. The voices of both those who made that history and the steeds they rode into battle will be silenced by time. That’s the sad reality of life. So we should savor those few voices, both mechanical and human, while we still can.